As a global employer, SYKES’ responsibility to our employees, customers and the communities in which we work and live is something we take seriously. SYKES is committed to finding ways in which we can reduce our impact on the natural environment, and be the best supply chain partner possible. Encouraging all of our employees to act as good stewards of the environment, we actively participate in recycling programs, energy conservation measures and employee environmental awareness programs. We’re also committed to finding ways to efficiently use resources to deliver our services. SYKES strives to be the best supply chain partner possible by continuing to report to the CDP Supply Chain, EcoVadis and Ecodesk as well as continuing to remain focused on our key sustainability value drivers. SYKES also asks our supply chain partners to participate in our Sustainability efforts through the use of our Supplier Code of Conduct. To learn more about SYKES’ Corporate Responsibility and Sustainability Program, please send an email to corporateresponsibility@sykes.com. Climate change, water scarcity and deforestation are unparalleled global challenges that require a systemic change in market behavior. To achieve this, CDP, formerly the Carbon Disclosure Project, is an international non-profit organization who runs the global disclosure system that enables companies, cities, states and regions to measure and manage their environmental impacts. To provide an efficient system for both buyers and sellers, EcoVadis creates reliable corporate social responsibility (CSR) ratings and scorecards covering 21 CSR indicators, 150 commodities, and 110 countries, built on 3 Pillars: People, Process, and Platform. 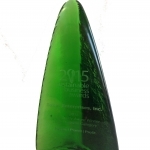 In 2015, SYKES received the CSR Silver Rating. 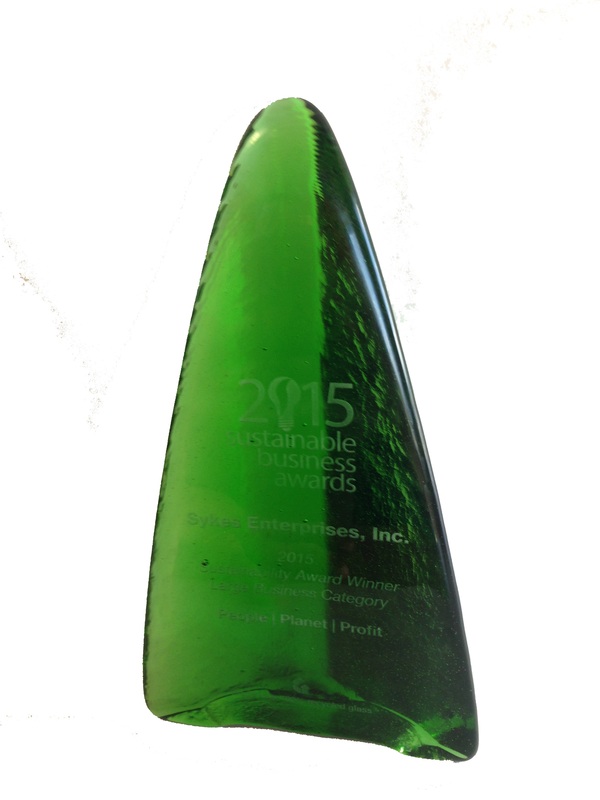 In 2015 SYKES was awarded a Sustany Foundation Sustainable Business Award. The awards are a partnership between the Sustany Foundation and the University of Tampa Center for Ethics, recognizing for-profit businesses in the Tampa Bay area engaging in practices to increase economic opportunities and improve the environment and community. Businesses are honored for their contributions in building a sustainable economy in Tampa Bay, while embracing the “Triple Bottom Line” — advancing the interests of People, Planet & Profit through innovative practices, products and services. Since 2014 SYKES’ Costa Rica operation has been Certified as Carbon Neutral by The National Institute of Standardization Association of Costa Rica (INTECO). This Certification includes SYKES operations in Heredia, Moravia and Hatillo for direct and indirect emissions of carbon dioxide, methane, nitrous oxide, hydroflourocarbons and employee travel. See more in our video about our commitment to carbon neutral. ComprometeRSE is SYKES’ Latin America’s corporate social responsibility strategy and includes SYKES Academy. ComprometeRSE focuses on four areas: people, operations, community and social development. Inspired by the United Nations Global Compact and the ISO 26000, the program is supported by more than 2000 volunteers in the Latin America region. See more about ComprometeRSE in our video. SYKES Academy provides English training for job candidates who do not meet minimum English proficiency requirements. This intensive non-profit English program provides training courses to people who apply for a job at SYKES but need to improve their English skills (oral, written, grammar, listening) in order to become eligible for hire. SYKES has provided over 700 jobs to program graduates, impacting over 12% of the working local community. Not measured, but invaluable, is the multiplied impact these beneficial language skills have on individuals in their future careers and personal lives. Our Edinburgh contact center is located close to a deprived area called Wester Hailes. This area is primarily social housing and marked by poverty and drug, alcohol and other abuses. Children at the local primary (elementary) school were attending without eating breakfast because parents don’t have money for food, perhaps through poverty, or because it is spent on drugs/alcohol. The school provides lunch to children but didn’t have the mandate or resources to provide breakfast, and their ability to concentrate and learn was affected because they didn’t eat early in the day, and the breakfast club, sponsored by SYKES, ensures that no child has to go hungry during the morning by providing breakfast when those in need get to school, so they can give their best in lessons. This statement is made pursuant to Section 54, Part 6 of the Modern Slavery Act 2015 and sets out the steps the Company has taken to ensure that slavery and human trafficking are not taking place in our supply chains or in any part of our business. How can one person’s recycling efforts help the environment? Consider this. It is estimated that one person recycling just half of the waste generated by their household can reduce carbon dioxide emissions by 2,400 pounds a year. Now multiply that by SYKES 50,000+ employees and the impact can be significant. That’s why SYKES has provided recycling bins for our employees in our offices worldwide to recycle numerous office supplies from paper to printer ink to plastic. In some offices, we have even provided a recycle center for employees to bring their recyclable products from home. Energy conservation isn’t just good for the earth, it also makes great financial sense. Many of SYKES offices throughout the world have replaced old lighting fixtures for new high efficiency and low energy utilization lighting fixtures. Not only have we reduced carbon emissions and experienced thousands of dollars in energy savings, in many cases, employees reported that the new fixtures actually provided better lighting. SYKES employees are also encouraged to purchase energy efficient equipment, and take simple energy conservation steps such as turning off lights in unoccupied rooms in our facilities. At SYKES, we believe the first step to environmental responsibility is simply sharing with others how we can all do our part to preserve the environment for our children and generations to come. Many of our offices have developed awareness programs designed to inform employees of how they can act in an environmental-friendly manner both at work and at home. Of course, we set the example, utilizing mostly electronic methods of communication to reduce our usage of paper.